Estrela Do Mar Beach Resort is a charming 3 star beach resort nestled amidst beautiful coconut and palm trees in Calangute in North Goa, India. The resort is spread over large area in the close vicinity of Calangute beach and at a very short distance from Baga and Anjuna Beach in Goa. 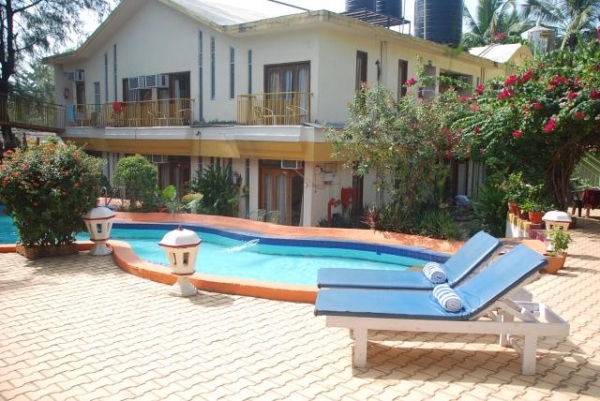 The resort is also easily accessible from the airports, railway stations, bus terminals and located in close proximity to all the tourist attractions in Goa. The resort offers plethora of deluxe facilities and services with pampering hospitality that will make one feel at home away from home. The beautiful beach resort in Calangute features 105 well-furnished, air conditioned rooms well-equipped with all the modern amenities and contemporary decor that introduces the guests to different colors of Goa. The resort has all the other deluxe facilities such as swimming pool, multi-cuisine garden and roof-top restaurant, a poolside bar, water sports activities arrangements, internet access, laundry services, conference rooms and lot of other recreational and adventure activities arrangements. The resort is a perfect destination for a truly enjoyable and refreshing beach vacation in Goa at a very reasonable prices. Note: Prices vary depending upon the period and the plan chosen (APAI / MAPAI / CPAI). Visit hotel official site for full details. If you have not decided yet or wants to customize tour itinerary or hotels listed above in "Estrela Do Mar Beach Resort Calangute Goa Holiday Package", then we can change the travel itinerary and make a personalized, tailor-made holiday package, especially for you. We can modify this travel package as per your itinerary, budget, duration and the tourist places you would like to visit, including transportation and airfare should be included or not. Please fill the form below to contact us.